Union Square Jewelry Buyers address, phone, website, and more. 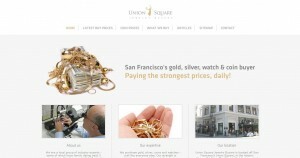 Union Square Jewelry Buyers is located off San Francisco’s Union Square, in the historic Shreve Building. The Shreve Building is one of the only structures to survive both the 1906 quake and fire that destroyed the entire area. Visit us and experience San Francisco history at the same time! We are a local group of industry experts – some of which have family dating back 5 generations to San Francisco’s Gold Rush. We are known for fairly appraising and purchasing your valued property, be it one piece or an entire estate. Bring your best price and let us get to work! We purchase gold, silver, coins and watches – just like everyone else. Our strength is experience and market knowledge, and our ability to recognize value where others can’t. Our buyers are experts in their respective fields – we have global markets to maximize your valuables.